We’ve been lucky enough to see this talented bunch of lads perform in front of a hyped up crowd a couple of times now, and even luckier to of had a bit of a chat with them along the way. Not only is their sound explosive and a good old “fist pumping singalong”, but they’re top blokes which kind of makes you root for them a bit more. Either way, their praise is well deserved. The Newry to Manchester 5-piece band have a unique sound and style; a mix of some of the true greats just blended into one incredible sound. They’re all about writing great songs that are simply made for a riotous singalong. You really don’t want to miss out on these lads. Mo & I (Hugh) are brothers and we met Micky at school. They started a band but their singer got into the habit of never showing up. I didn’t wanna admit it but I was dead keen to get involved. I was writing my own stuff for a while and after dropping a few hints and playing my guitar really loudly in my room until they asked me to come down and jam with them. We played a few shows in Newry then soon they started selling out and attracting a bit of a following. That’s when we thought we should make a proper go of it and move to Manchester. A year or three later we met Mike ‘Hilly’ through a gypsy punk band he was in. We became really good friends. In time, that band called it a day so we got him involved. As for guitarists: we buried about seven lead guitarists along the way. Mostly lost them due to them taking the opportunity they had in front of them for granted, getting lazy and lacking in commitment. That & girlfriends, they seem to have the skill of causing trouble and differences in a band. I was telling a friend Liam about how much of a nightmare we were having and he recommended Joey to us. We just clicked and it’s been all good since then. 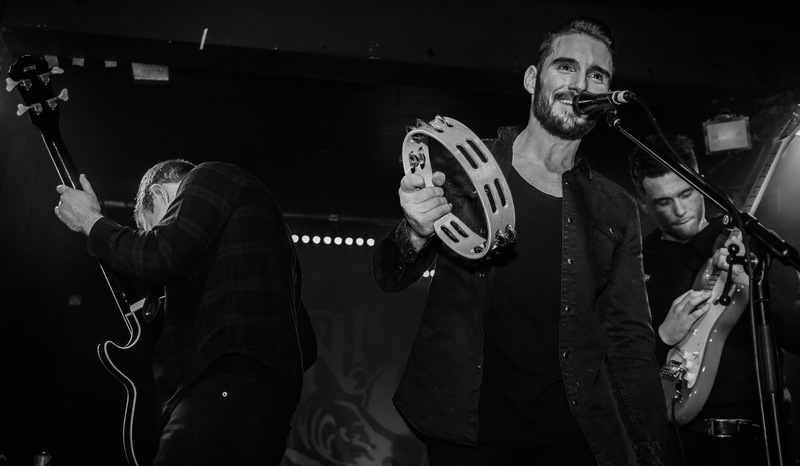 We saw you perform at Night & Day Cafe in Manchester with This Feeling a couple of weeks ago, how was the night for you? What was your biggest highlight from the night? Obviously seeing the scotts crew there! I can’t remember all of it to be honest, but there were loads of highlights. I think the excitement of it all made me drink faster than usual but from what I remember it was mayhem. We’re very lucky to have the support we do and we can’t thank them all enough. Almost every song was sang back to us. Especially a new unreleased one ‘Be Mine’ – the whole place sang it back! That was mental. I spoke to some absolute legends after we played who flew over from Germany, Paris, Stockholm and Ireland too. I couldn’t believe it and still can’t if I’m honest. You announced the single “Attack Dog” late last year, what’s the reaction been like? What was the inspiration for the song? The reaction’s been great. We’ve had a few pretty sweet reviews and it goes down really well live. Someone said the other night it’s like if Elvis came back and started playing the electric guitar. I think this was like six in the morning though so we’ll leave that one there. I wrote the song about an old guitarists’ misses. Her nonsense lead to him leaving the band. Slowly but surely poisoning him, leading to delusions of grandeur. I remember saying wow she’s like a proper attack dog. The next day the song just came out. If you could pick, what would be your dream tour line up? King Kartel, Gerry Cinnamon, Trampolene and Last Race Home I’d say would be some craic! Though we’d probably all die before the half way point. All things rock ‘n’roll, but it started with Manchester music. Kasabian, Jonny Cash, Elvis & The Beatles, Vinyl (HBO). It would be nice to have bit of the good life, selling out massive venues, thousands of people singing the tunes back to us. The memories that no amount of money that a boring corporate high paid job could ever pay for. And obviously own a tiger. There are no guilty pleasures in music only good tunes! I quite like loads of old trance tunes like Discoland, I Wanna Be A Hippy etc. I’ve no idea as we’re still trying ourselves but maybe: Believe in what you do, don’t be afraid to take the hits, don’t take anything personally, be stubborn, know your worth and refuse to give up. People will try to put you off, put you down and tell you you can’t do this forever and you need to stop dreaming. I’d choose being a dreamer any day and truly live, rather than just exist. What’s next for you guys, is a tour on the cards? Manchester Academy 3 on May 10th with This Feeling. Also some other dates around the country which we’ll soon reveal. There’s talk of Paris and we’d love to do a few more around Europe while we’re over. Fingers crossed around April. I’d like to get back to Ireland for a few gigs if we can too. In the meantime, might as well stock up on your gig essentials for when you catch King Kartel in the act. Check out our latest arrivals.